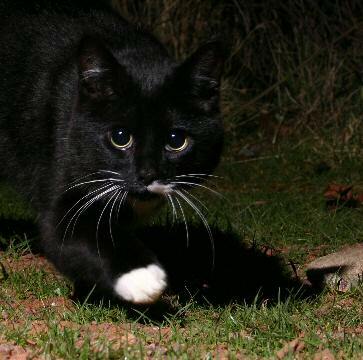 We are not fond of cats, and they are rightly blamed for a lot of wild bird deaths. 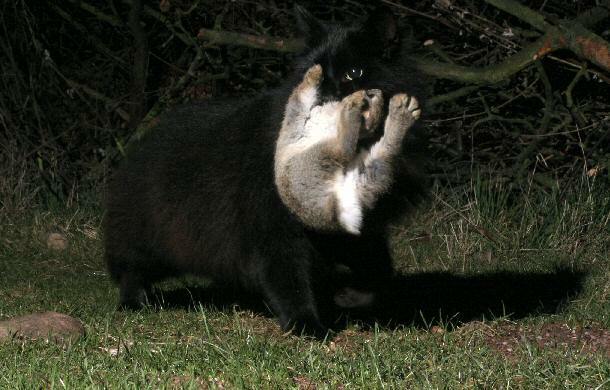 However, the cats in this area tend to earn their keep on the farms keeping down vermin, but even we were surprised to see this black cat walking through the night photo kit with a young rabbit in it's mouth. The same morning we found the remains of the rabbit about 30m away being picked over by a carrion crow and various other corvids. We would normally have assumed this was a fox kill. The day after you wouldn't have known anything had happened. The three images show what we assume is the same cat and rabbit. 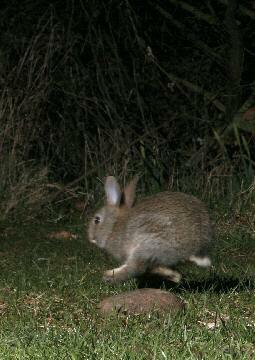 The lone Cat was taken around midnight 8 Mar 2004, The young rabbit running from something at 05:20 on 15 Mar 2004 and the rabbit meeting its end 17 minutes later.